The structure file fcContactFormStructure.xml describes the form fields, their types and properties. The form is based upon the data from this file and therefore will not work correctly in case this file contains errors. It is not recommended to edit this file without understanding of what you are doing. The structure of this file should coincide with the existing fields that have already been created in Flash and indexed. Adding a new item in this file will not create a new field in the form. To do this you need to add a new field in Flash as well, that is to insert it in the .fla file with the Flash Authoring Environment and generate a new .swf file from it. To get more details on how to do this please refer to this section. This file is created in the XML structural language and should conform to all standards of this language (http://www.w3.org/XML/). That is why we strongly recommend you to use XML editors (e.g. Altova XMLSpy and others) to work with this file. Any errors made in this file can cause to a malfunctioning contact form. id (required attribute) is a unique item number of the form. It’s not required for the item numbers to be put in order. It’s quite possible for the item with id=2 to go first. But it is significant for them to be unique and the number of items should correspond to the highest id. That is if you have four items the ids should be from 1 to 4.
label (required attribute) is a name of the form item which is used for the validation error messages or is bound with a given field and its value on sending a message. required (optional attribute) takes one of the two values ‘ true’ or ‘false’ and defines if the input field is required or not on submitting the form. By default required is set to false. The field type should correspond to the form item that is created in Flash. That is if you have a combobox (select) in Flash the type must be select and nothing else. By default type has got the text value. When using a validator, additional properties pertaining to a specific validator can be used. regExp — regular expression the field value should match. It is used together with regExpFlags. g — global, defines whether the search should match all occurrences of the given pattern. If it is omitted just the first occurrence should be matched. i — caseInsensitive. If it is present the case is disregarded. mask – a mask which the date should be validated with. By default it is mm/dd/yyyy. The dividers do not matter. If mm, dd or yyyy could not be found the default mask is used. The fields of this type can be related with the help of the attributes of the dataProvider property: dependence and depth. The easiest example here is the following relation: Car Brand :: Model :: Available Colors. There are different brands. Each brand has its own models. Each model has its own colors. • delimiter — a string used for the formatting of the e-mail body on sending it and is inserted between the values. For instance in case of checkboxes a comma ( ‘, ‘) is used frequently. As a result we get: Interests: interest 1, interest 2, interest 3 and so on. • shouldBeEqual – true or false, false is by default. If it is true the values of all the group fields are compared and if they are not equal an error is fired. 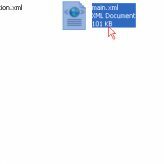 This entry was posted in Working with XML-based forms, XML Flash Template Tutorials, XML Flash Templates and tagged flash, forms, XML. Bookmark the permalink.